Take these trends from runway to room to enhance your interiors. Television presenter and fashion journalist Louise Roe shows how you can take these trends from runway to room to enhance your interior in line with the world’s fashion elite. Timeless and clean, black and white was not only on the catwalks this season, but also many red carpets. Sleek and effective, opt for graphic prints with a twist of mod, when decorating your home. Stripes look fantastic on different pieces next to each other, but steer clear of polka dots or black and white florals: this is about a neat, retro look. And for a touch of glamour, don’t be afraid to add a splash of metallic. Gold works well with black and white, but silver or gunmetal is, in my opinion, the coolest way to make a shiny, chic statement. There’s no better style statement for Spring than Marchesa’s decadent, Baroque-inspired runway show. It’s always one of my favorite collections to watch at New York fashion week, and Spring was eye-poppingly rich and luxurious. Time to think like a princess, decorating her palace. Gold thread, gold embellishment and gold lace decorated every dress: more is most definitelymore this season when it comes to making grand gestures. Translate Marchesa’s Baroque gowns into your home with liquid gold tones, duck-egg blue and warm cream. A chandelier is a stand-out, central piece: hang it low over a shiny coffee table for the ultimate, glamorous effect. Another key feature is legs! Legs on a bathtub, legs on a tufted sofa, legs on a chaise-longue. And update beds and sofas with embroidered cushions and throws in the same color palette. I’ve always been a fan of the sumptuous 1970’s style of furnishing a home. Talitha Getty and her iconic style, sums up the mix of elegance and bohemia I’m imagining. Valentino nailed this eclectic mix, by sending a mash up of folklore and regal, print and fringing, Aztec-meets-Native American, meets Egyptian pieces down the runway. Punchy turquoise, metallic red, dark emerald green and ornate gold embellishment headlined the colour-scheme. Keep those in mind when scouring the web for statement pieces to add to your home. Jacquard scatter cushions, symmetrical tiered picture frames and mirrors, and richly embroidered rugs. What I love best about this trend is how easily you can mix in pieces from different countries, so if like me, you’re a traveller who picks up pieces wherever they go, you’re in luck. Time to display them! As a style expert, nothing makes me happier than wearing red. It’s a passionate, fiery and beautiful colour that instantly lifts my mood. Designers used splashes of scarlet at fashion weeks all over the world this season, which made me very happy! 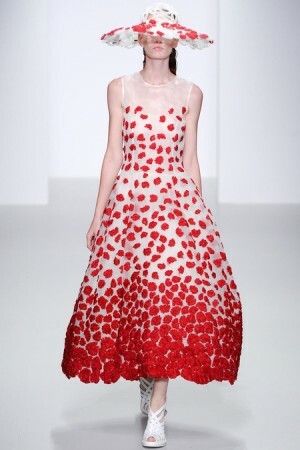 The look that particularly caught my eye, was at John Rocha, who combined red with another huge trend, floral applique. So to recreate the look in your home, think about using red with texture, think about making it feminine, but also using sharp lines and print, to create a rich, layered look to your room. Speaking of rooms, leave the red to your dining room or living room – it’s a great colour to have around when you’re entertaining, but not the most calming when you want to sleep – so avoid it in the bedroom. Find red patterned lampshades, textured lamp bases, lacquered trays and red Murano vases or jugs.